I love it when people ask for recommendations for Prague on social media, just to see what the popular choices are. Unfortunately, I tend to disagree with the most common ones: Maitrea, Lehka Hlava and Loving Hut. Personally I’ve always found the latter to be a reliable back-up choice with hearty portions of decent food, but it’s never on my itinerary when I’m on holiday. 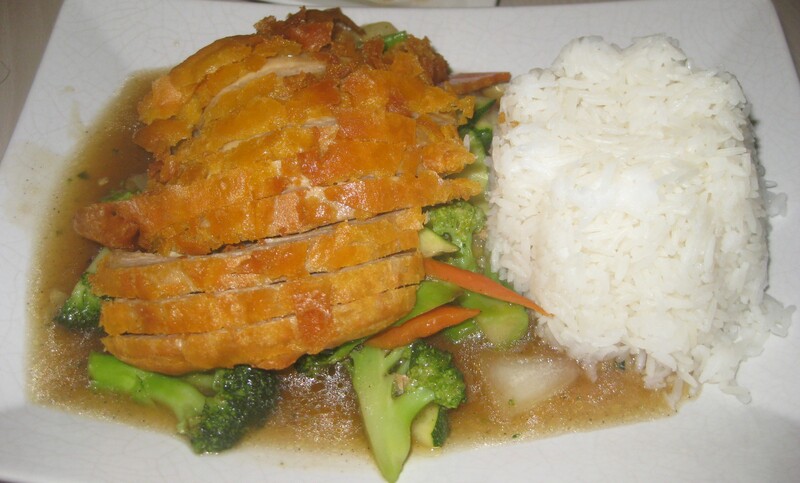 I first discovered it when I was living in Hong Kong, and was a big fan of the mock meat dishes there. In Prague I think the food isn’t quite as good, but it’s still a good option to have. Not holiday-itinerary-good, though. You can also order from the menu (though be warned that the customer service is very typically Czech and may leave a lot to be desired if you’re not used to it). 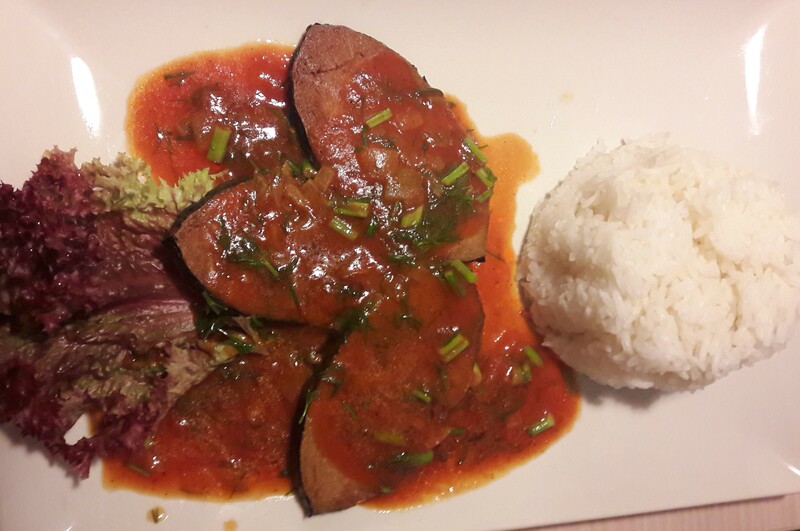 There are a few Italian and western (hamburger) dishes, that I personally would always steer clear of because they don’t really play to the strengths of the chain – I rely on them for good Asian food, but fear their non-Asian dishes might not be so good. 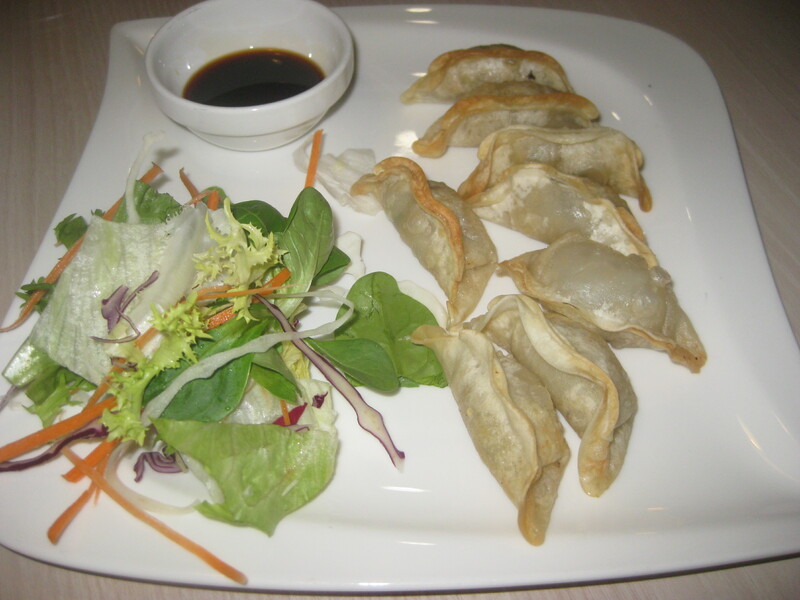 They have a tempting selection of starters, including these crispy little dumplings which are great to share. When my brother was staying with us we took him here for an emergency lunch after finding ourselves short of options in the city centre. 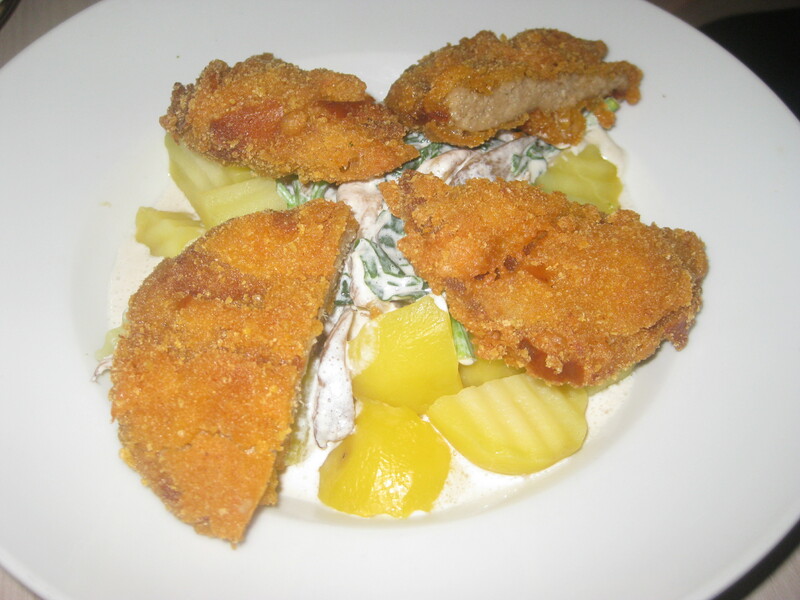 Surprisingly, he went for a classic European dish with this schnitzel and mash. Even more surprisingly (for he is a happy meat-eater), he really enjoyed it! This just goes to show that nobody can argue with the Loving Hut’s mock meat dishes – they really know what they’re doing. 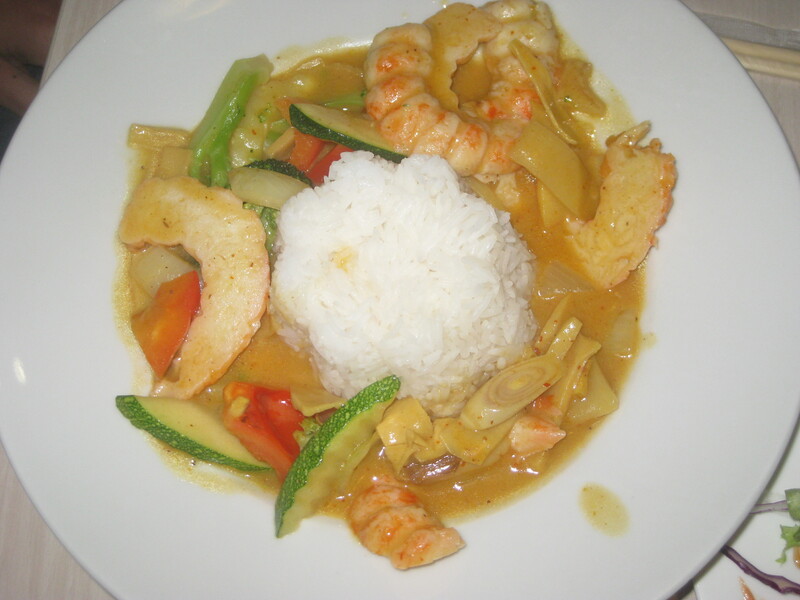 Dr HH was tempted by the mock prawns and got this Thai curry. The prawns were excellent, but unfortunately the curry itself was a bit bland. It also contained a few chunks that were inedible – we thought they might be bits of artichoke. It was a shame, and he wouldn’t order it again. 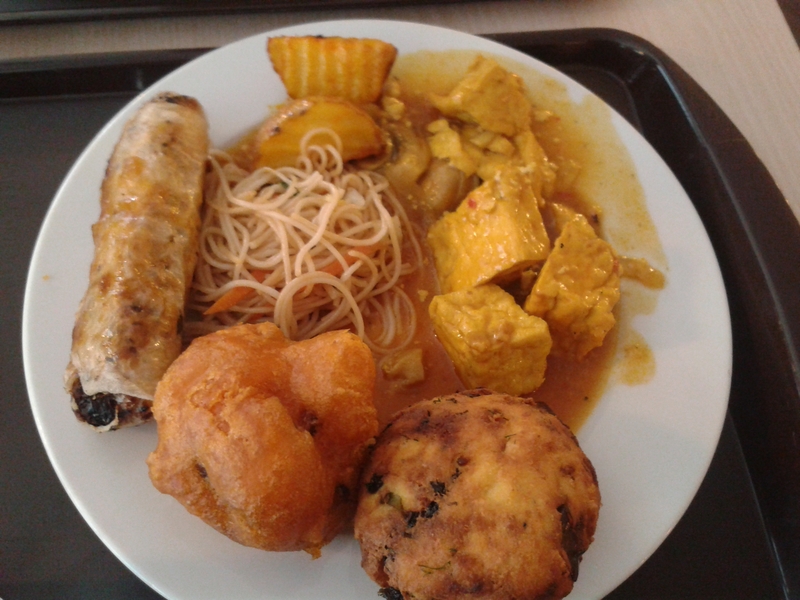 I was far happier with my choice, the Cantonese Speciality. 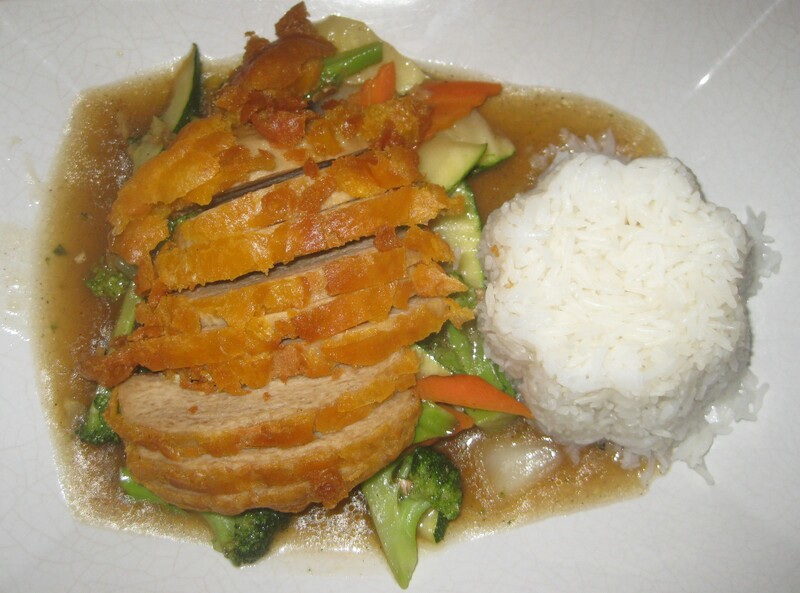 The vegetables are served in a nice gingery sauce, but the real highlight is the battered soy slices. They are so good and crispy! The portion was gigantic, I couldn’t even eat it all. I ordered the same again when I went back with Dr HH (in fact, we basically went just so I could have another helping). He went for the sea slices this time: some lightly battered soy slice in a dilly sauce. This was a step up from the curry, though there was a bit too much dill. The slices were nice and crispy though, and he enjoyed it as a whole. However, he says he’s not too fussed about going back as there isn’t much else on the menu that tempts him. Something tells me we’ll be back for cake though. Look at these beasts! Dr HH had never tried black forest gateau before, so he had to give it a go and was suitably impressed. I just love carrot cake and rarely see it in Prague, so I pounced on this one. It had four layers, and an icing carrot on top, which automatically makes it a winner in my eyes. It was a beautiful sponge, and I would definitely recommend it. 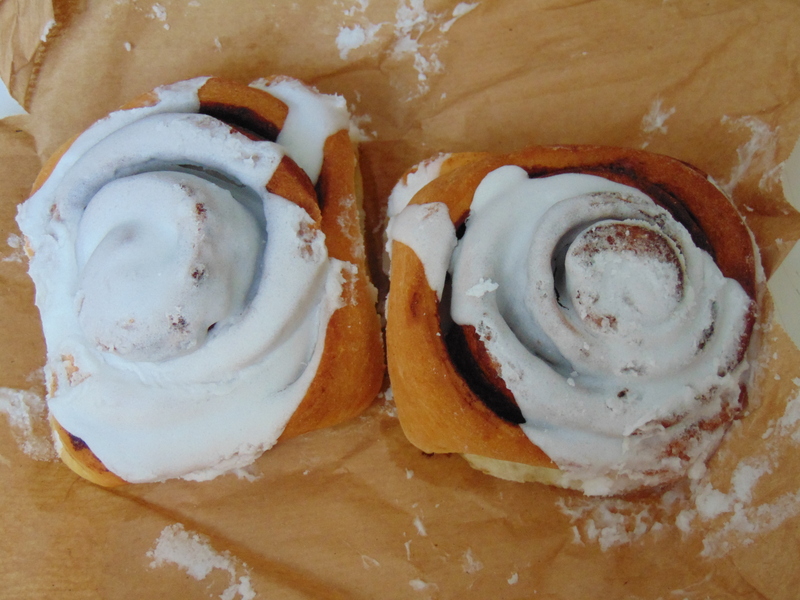 We were also delighted to spot some cinnamon rolls on the buffet counter too, so we grabbed some to takeaway for breakfast the next day. You can’t really tell from the picture but they were absolutely huge – and totally delicious! For sweet treats, Loving Hut is highly recommended – for main dishes and the buffet, I’d say it’s always reliable, but rarely exceptional. 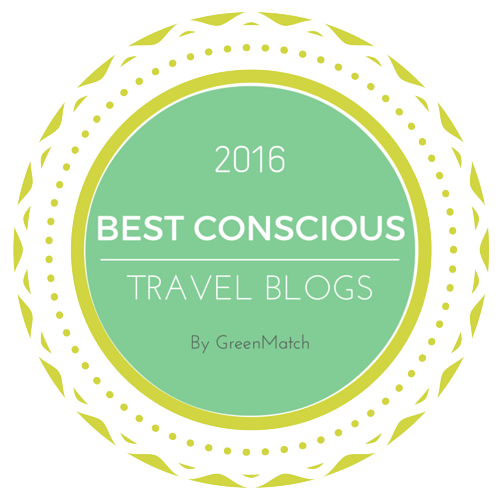 This entry was posted in Travel and tagged Prague Loving Hut review, vegan Prague, vegan travel. Bookmark the permalink. Does the Loving Hut in Prague play weird religion lectures on TV screens? The one I went to in Orlando Florida did and it really rubbed me the wrong way. I do like how each location is very different from each other. No, none of them have that here, but they did in Hong Kong and I absolutely hated it! There were lots of speeches by the Supreme Master, and I vividly remember a poem from the perspective of a piglet being raised for slaughter. I’m definitely pleased they don’t have that here. 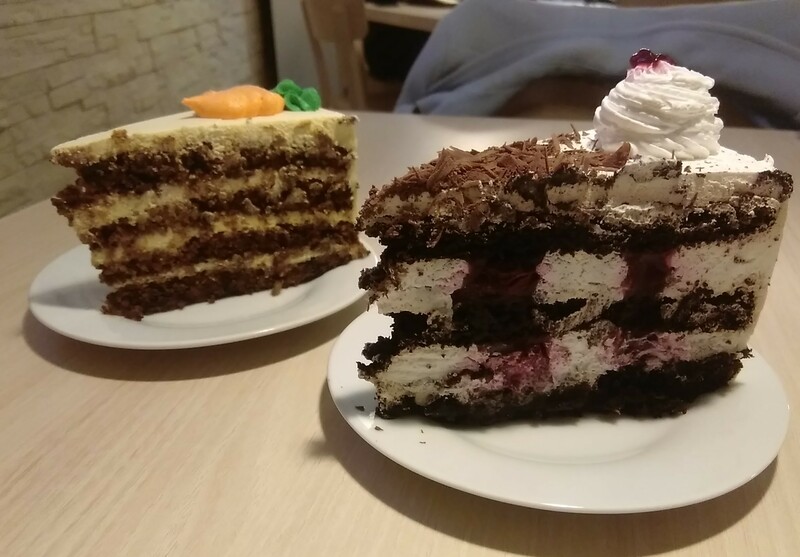 Yeah,even if the meals are unspectacular, it’s definitely worth going for the sweet treats! They’re also always at the vegan festivals here with deep fried food and cakes, so they never disappoint on those occasions! I think your last sentence pretty much sums up every experience of Loving Hut I’ve ever had. Which is not a criticism – there have been so many times when Loving Hut has been the only vegan place open when we needed one, I’m glad they’re out there, doing their thing. Especially when their thing is cake! Exactly! It surprises me when some people rave about it, but maybe it depends on the individual branch.